Am I the only one who got excited with when CC Creams started to hit the stores? I know most people were skeptical, some even commented snidely on how overrated it was! When I discovered CC Cream, I immediately wanted one. That's why when Clinique sent me a sample of their new CC Cream, I was over the moon. In comes this month, Clinique Moisture Surge CC Cream! Now why am so eager to try CC Creams? I just think that it fits our skin type. Controls oil better than a BB Cream, has more coverage than a tinted moisturizer and safer to use on a regular basis than it is a foundation. CC also stands for several things like color corrector or complexion corrector. And that's one of the reason why I prefer this over the more popular BB Cream. Unlike others who have used CC Creams, I had high hopes with this one, almost too giddy when I first tried it and guess what... it was good! It's not a miracle worker that all your skin problems will disappear. Definitely not. Clinique Moisture Surge CC Cream is not full coverage so expect a few struggles if you have cystic throbbing-red acne. But it will definitely cover up redness, dark spots and brighten up your face almost immediately. All this despite it's sheer consistency. I know, it's amazing! If you problems with skin discoloration like rosacea, freckles or troublesome redness on the sides of the nose and cheeks, this could just do the trick to even out your skin tone. It's very light-weight so it doesn't weigh down the skin as much. And since I'm a big fan of Clinique Moisture Surge, I get the same benefits and feel more securely with my skin. I do after all have dry patches on my skin, too. I love that this leaves the skin looking naturally beautiful when ever I apply it. Oil control is still not the same as a regular foundation but a few notches better than a BB Cream. In my experience, my T-zone becomes oily an hour or two after applying. But I've got extremely oily skin so unless I'm using Estee Lauder Double Wear Foundation or MAC Studio Fix, oilies still creep up no matter what. Thick and creamy, almost gel-like consistency is a dream to blend into the skin. You can use either your fingers (make sure it's clean) or what I prefer most, a flat top brush. And the best about the Clinique Moisture Surge CC Cream is that it comes in 12 shades! I'm not exactly sure if they'd be carrying all shades here in the Philippines but it sure is a sigh of relief that we get to choose the shade that matches our skin. Something a BB Cream could hardly give us. Here's a swatch of Natural Fair in a medium-fair skin tone. And here's my nth try-out! So in love with this CC Cream! I highly recommend it. 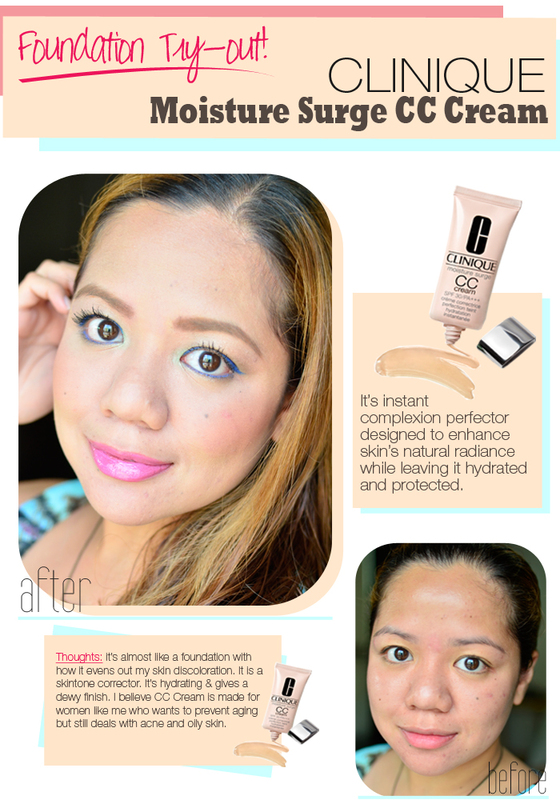 In fact, I seriously am considering including this on my top 10 favorite foundations (albeit it isn't one!). See how already evens out my skin and I barely used concealer (under eyes and some seriously dark spots). Better get those little bums to the nearest Clinique (mine is in SM Aura! Yey!) and get a tube as it's out! For updates and special promos, visit Clinique Philippines Facebook page today!